Spina bifida is a birth abnormality in which the spine is malformed and lacks its usual protective skeletal and soft tissue coverings. Spina bifida may appear in the body midline anywhere from the neck to the buttocks. In its most severe form, termed spinal rachischisis, the entire spinal canal is open, exposing the spinal cord and nerves. More commonly, the abnormality appears as a localized mass on the back that is covered by skin or by the meninges, the three-layered membrane that envelops the spinal cord. Spina bifida is usually readily apparent at birth because of the malformation of the back and paralysis below the level of the abnormality. Various forms of spina bifida are known as meningomyelocele, myelomeningocele, spina bifida aperta, open spina bifida, myelodysplasia, spinal dysraphism, spinal rachischisis, myelocele, and meningocele. The term meningocele is used when the spine malformation contains only the protective covering (meninges) of the spinal cord. The other terms indicate involvement of the spinal cord and nerves in the malformation. A related term, spina bifida occulta, indicates that one or more of the bony bodies in the spine are incompletely hardened, but that there is no abnormality of the spinal cord itself. Spina bifida occurs worldwide, but there has been a steady downward trend in occurrence rates since about 1940, particularly in regions of high prevalence. The highest prevalence rates, about one in 200 pregnancies, have been reported from certain northern provinces in China. Intermediate prevalence rates, about one in 1000 pregnancies, have been found in Central and South America. The lowest prevalence rates, less than one in 2,000 pregnancies, have been found in European countries. The highest regional prevalence in the United States of about one in 500 pregnancies has occurred in the Southeast. Spina bifida may occur as an isolated abnormality or in the company of other malformations. As an isolated abnormality, spina bifida is caused by the combination of genetic factors and environmental influences that bring about malformation of the spine and spinal column. The specific genes and environmental influences that contribute to the many-factored causes of spina bifida were not as of 2004 completely known. An insufficiency of folic acid is known to be one influential nutritional factor. Changes (mutations) in genes involving the metabolism of folic acid are believed to be significant genetic risk factors. The recurrence risk after the birth of an infant with isolated spina bifida is 3 to 5 percent. Recurrence may be for spina bifida or another type of spinal abnormality. Spina bifida may arise because of chromosome abnormalities, single gene mutations, or specific environmental insults such as maternal diabetes mellitus or prenatal exposure to certain anticonvulsant drugs. The recurrence risk varies with each of these specific causes. In most cases, spina bifida is obvious at birth because of malformation of the spine. The spine may be completely open, exposing the spinal cord and nerves. More commonly, the spine abnormality appears as a mass on the back covered by membrane (meninges) or skin. Spina bifida may occur any where from the base of the skull to the buttocks. About 75 percent of abnormalities occur in the lower back (lumbar) region. In rare instances, the spinal cord malformation may occur internally, sometimes with a connection to the gastrointestinal tract. In spina bifida, many complications arise, dependent in part on the level and severity of the spine malformation. As a rule, the nerves below the level of the abnormality develop in a faulty manner and fail to function, resulting in paralysis and loss of sensation below the level of the spine malformation. Since most abnormalities occur in the lumbar region, the lower limbs are paralyzed and lack sensation. Furthermore, the bowel and bladder have inadequate nerve connections, causing an inability to control bowel and bladder function. Most infants also develop hydrocephaly, an accumulation of excess fluid in the four cavities of the brain. At least one of every seven cases develops findings of Chiari II malformation, a condition in which the lower part of the brain is crowded and may be forced into the upper part of the spinal cavity. There are a number of mild variant forms of spina bifida, including multiple vertebral abnormalities, skin dimples, tufts of hair, and localized areas of skin deficiency over the spine. Two variants, lipomeningocele and lipomyelomeningocele, typically occur in the lower back area (lumbar or sacral) of the spine. In these conditions, a tumor of fatty tissue becomes isolated among the nerves below the spinal cord, which may result in tethering of the spinal cord and complications similar to those with open spina bifida. Few disorders are to be confused with open spina bifida. The diagnosis is usually obvious based on the external findings at birth. Paralysis below the level of the abnormality and fluid on the brain (hydrocephaly) may contribute to the diagnosis. Other spine abnormalities such as congenital scoliosis and kyphosis, or soft tissue tumors overlying the spine, are not likely to have these accompanying findings. In cases in which there are no external findings, the diagnosis is more difficult and may not become evident until neurological abnormalities or hydrocephaly develop weeks, months, or years following birth. Prenatal diagnosis may be made in most cases with ultrasound examination after 12 to 14 weeks of pregnancy. Many cases are also detected by the testing of the mother's blood for the level of alpha-fetoprotein at about 16 weeks of pregnancy. If the spine malformation is not skin covered, alpha-fetoprotein from the fetus's circulation may leak into the surrounding amniotic fluid, a small portion of which is absorbed into the mother's blood. Aggressive surgical and medical management have improved the survival and function of infants with spina bifida. Initial surgery may be carried out during the first days of life, in the hope of providing protection against injury and infection. Subsequent surgery is often necessary to protect against excessive curvature of the spine, and in the presence of hydrocephaly, to place an echanical shunt to decrease the pressure and amount of cerebrospinal fluid in the cavities of the brain. Because of weakness or paralysis below the level of the spine abnormality, most children require physical therapy, bracing, and other orthopedic assistance in order to be able to walk. A variety of approaches including periodic bladder catheterization, surgical diversion of urine, and antibiotics are used to protect urinary function. Although most individuals with spina bifida have normal intellectual function, learning disabilities or mental retardation occur in a minority. This deficit may result, in part, from hydrocephaly and/or infections of the nervous system. Children so affected may benefit from early educational intervention, physical therapy, and occupational therapy. Counseling to improve self-image and lessen barriers to socialization becomes important in late childhood and adolescence . Open fetal surgery has been performed for spina bifida during the last half of pregnancy. After direct closure of the spine malformation, the fetus is returned to the womb. By preventing chronic intrauterine exposure to mechanical and chemical trauma, prenatal surgery improves neurological function and leads to fewer complications after birth. Fetal surgery is considered experimental, and results have been mixed. More than 80 percent of infants born with spina bifida survive with surgical and medical management. Although complications from paralysis, hydrocephaly, Chiari II malformation, and urinary tract deterioration threaten the well-being of the survivors, the outlook for normal intellectual function is good. 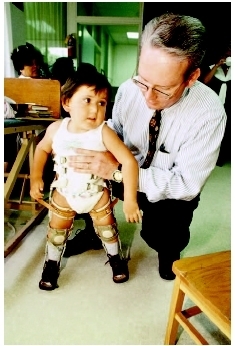 Prevention of isolated spina bifida and other spinal abnormalities became possible in the 1980s and 1990s. The major prevention is through the use of folic acid, one of the B vitamins , for several months prior to and following conception. The Centers for Disease Control and Prevention (CDC) recommend the intake of 400 micrograms of synthetic folic acid every day for all women of childbearing years. For women who have had a previous child with spina bifida, the CDC recommends a daily intake of 4 milligrams of synthetic folic acid to help prevent a recurrence of spina bifida in future pregnancies. Caring for a child with spina bifida can be a daunting endeavor. Initially, parents may be overwhelmed with the medical decisions to be made and with the grief experienced after the birth of a special needs child. Many parents benefit from early and continuing involvement of an experienced social worker. There will be a multitude of medical decisions to be made. Children with spina bifida require a multidisciplinary team of healthcare providers, including surgeons, physicians, and therapists. Parents may find it helpful to designate a physician, usually the primary pediatrician, or an experienced rehabilitation counselor to act as an advocate for their child and to aid them in coordinating their child's treatment program. Doctor examining a child with spinal bifida. as well, such as positional aides to help the child sit and stand, physical therapy, and bracing and splints usually of the lower extremities. Parents of children with spina bifida experience an array of emotions, including grief, fear , anxiety , and stress. Spina bifida impacts not only the affected child but the entire family . Groups and networks of other families affected by spina bifida can provide valuable support. Parents may need to be active in ensuring that their child receives the early intervention and educational services available in their community. Each state has programs to encourage healthy development in children with special needs. Finally, parents should remember that most children with spina bifida live productive and happy lives. For the most part, children with spina bifida have average or above-average intelligence . Many of these children can go on to higher education, have active careers, and live self-sufficiently. It is important for parents to encourage strong self esteem in their child and to foster independent living skills. Chiari II anomaly —A structural abnormality of the lower portion of the brain (cerebellum and brainstem) associated with spina bifida. The lower structures of the brain are crowded and may be forced into the foramen magnum, the opening through which the brain and spinal cord are connected. Behrman, Richard E., Robert M. Kliegman, and Hal B. Jenson, eds. Nelson Textbook of Pediatrics , 16th ed. Philadelphia: W. B. Saunders, 2000. Sutton, Amy L. Back and Neck Sourcebook: Basic Consumer Health Information. Detroit, MI: Omnigraphics, 2004. National Birth Defects Prevention Network. Web site: http://www.nbdpn.org. Shriners Hospitals for Children. International Shrine Headquarters, 2900 Rocky Point Dr., Tampa, FL 33607–1460. Web site: http://www.shrinershq.org. Spina Bifida Association of America. 4590 MacArthur Blvd. NW, Suite 250, Washington, DC 20007–4226. Web site: http://www.sbaa.org.